See Celebrities' favorite designer store with their latest collection of sarees and tunics. 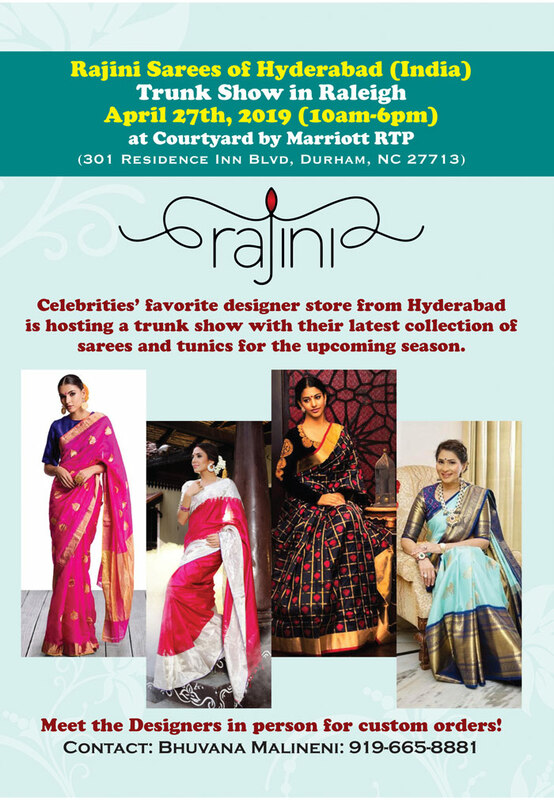 Rajini Sarees of Hyderabad will be hosting a Trunk Show at the Courtyard by Marriott RTP in Durham on Saturday, April 27, 2019 from 10am to 6pm. Come see Celebrities' favorite designer store with their latest collection of sarees and tunics from the upcoming season. Meet the designers in person for custom orders! For more information, contact Bhuvana Malineni @ 919-665-8881.